Groupe Doo Wop US originaire de Louiseville (Kentucky). 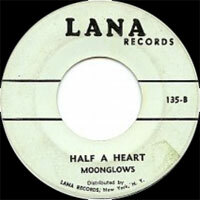 Les Moonglows ont été formé en 1951 sous le nom des Crazy Sounds et comprenaient Harvey Fuqua, Alexander Graves et Prentiss Barnes. 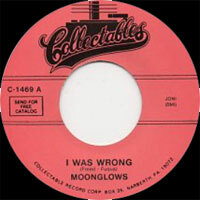 En 1952, le groupe devient les Moonglows avec l'arrivée de Bobby Lester et du guitariste Billy Johnson. Ils enregistrent alors sur le petit label local Champagne Records, puis en 1954, ils signent avec Chess Records de Chicago (Illinois). Le groupe a compté parmi ses membres Marvin Gaye. 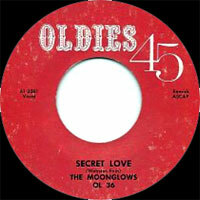 The Moonglows were among the most important R&B groups of the 1950s, despite the fact that they only had a handful of hits among fewer than 50 recorded songs, in a history that lasted just six years, in sharp contrast to such acts as the Orioles and the Drifters, who were together across decades and recorded huge bodies of work. Chicago-born Harvey Fuqua (born July 27, 1928) was part of a musical family virtually from birth, as the nephew of Ink Spots guitarist Charlie Fuqua, and before he was in his teens was aiming for a career of his own in music. He grew up in Louisville, KY, where he learned the piano and also began singing with his high school classmate Bobby Lester (born January 13, 1930; died October 15, 1980) at dances. They formed a professional duo in Louisville during 1949, after both finished brief periods of serving in the military, and were soon working with saxman and bandleader Ed Wiley, and it was in his group that they started singing jump and blues. Eventually a lack of earnings led them to split up, with Fuqua moving to Cleveland, where he crossed paths with an army buddy, Danny Coggins, and a neighbor of his, Prentiss Barnes (born April 25, 1925), who'd previously been a gospel singer, and formed a trio. Fuqua brought Lester into the group, which was known as the Crazy Sounds, and they started to get work in the area around Cleveland. They were an improvisational singing group that specialized in a technique called Vocalsese, using their voices to replace instruments, basically in a jazz context, somewhat similar to the work of the Swingle Singers and the Manhattan Transfer. Their first break came in 1952 when they came to the attention of local disc jockey Alan Freed, who was already making a name for himself playing R&B records. 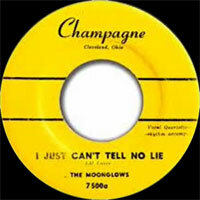 They auditioned and did well enough to earn a chance to record on Freed's own Champagne Records label, changing their name to the Moonglows in the process in an effort to hook their recognition to Freed's on-air persona as "Moondog." 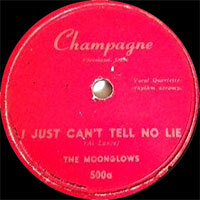 The group enjoyed a modest local hit with a Lester composition, "I Just Can't Tell No Lie." They began performing in venues throughout the industrial Midwest and underwent their first membership change when Coggins quit for a more stable life as a gas station owner. He was replaced by Alex Walton and Alexander Graves. Lester and Fuqua shared the lead Vocals spot, sometimes even on the same song, and both of them had a keen interest in songwriting as well. The group was special not only for their mix of subtle polish and visceral excitement, but also the sheer attractiveness of the singing and the way in which their arrangements locked it all together -- Lester and Fuqua were the leads and the most visible talents, but there were no weak links anywhere in the Moonglows' sound; from bass to the occasional falsetto, all of the singing was dazzling, animated, and bracing, whether on the jump numbers or the ballads; each of their finished records was the total package, distinctly voiced, gorgeously textured, and exciting. In the early fall of 1953, Freed landed the group a contract with Chance Records, a small Chicago outfit that was making a serious noise in blues and R&B, and already had the Flamingos and the Spaniels under contract. For a year, they tried to chart with ballads -- including a killer version of "Secret Love" with Lester singing lead -- and jump numbers but saw little success at Chance, before they were dropped. 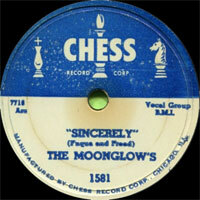 In October of 1954, the group moved to Chess Records, and their first session was one of the most productive in the history of the label, yielding 13 songs including one of the biggest hits in Chess' history, "Sincerely" -- authored by Fuqua (with Freed taking half the royalties as "co-author," a common arrangement at the time for Freed and other managers), the Moonglows' recording charted in December of that year and bumped "Earth Angel" by the Penguins out of the number one R&B spot the following month, and later climbed to number 20 on the Hot 100 pop chart. The single rode the R&B listings for 20 weeks and sold over a quarter of a million copies, an extraordinary number for Chess in those days and all of it happening before R&B had fully crossed over to white listeners. It was numbers like this that were delighting independent executives like Phil and Leonard Chess, and giving ulcers to executives at the major labels, who saw something happening in music that they'd somehow missed over the preceding year or two and were having trouble grasping even then. 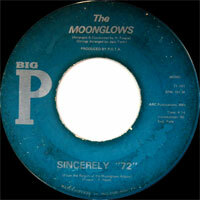 In the case of "Sincerely," it was such an attractive song that it begged to be covered by other artists in other styles -- thus, the Moonglows became one of the earliest R&B groups to see an original of theirs picked up by a pop act, when the white sibling Vocals trio the McGuire Sisters covered "Sincerely" in a pop style and got a number one pop hit and a million-selling single out of it. The success of the Moonglows' original version was the break they'd been waiting for, and they began playing some of the best gigs of their history, as part of Freed's huge package shows alongside acts like Joe Turner, the Clovers, and Lowell Fulson. In early 1955, the group's ranks expanded with the addition of Billy Johnson, a guitarist who'd previously played with Charles Brown. During the summer of 1955, the group was part of a package tour that included Muddy Waters, Sarah Vaughan, and Nappy Brown. 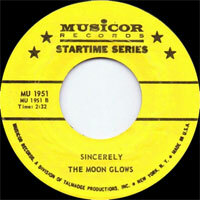 Alas, they found it difficult to repeat the crossover pop success of "Sincerely" -- the group did produce such worthy efforts as "Most of All" (number five R&B), "Foolish Me," "Starlite," and "In My Diary." 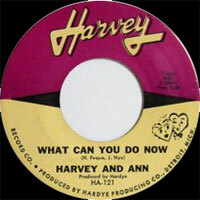 Then, in the middle and latter half of 1956, they succeeded anew with the ballad "We Go Together," which reached number nine on the R&B charts and attracted considerable interest from young white listeners in the bargain; and the rock & roll number "See Saw," which reached number nine R&B and got to number 25 on the pop charts. 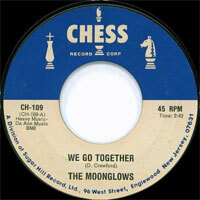 During this period, Chess also briefly attempted to double-up on the group's approach to the airwaves and radio play lists by taking some of the sides featuring Lester and Fuqua together on lead and issuing those under the name "the Moonlighters." 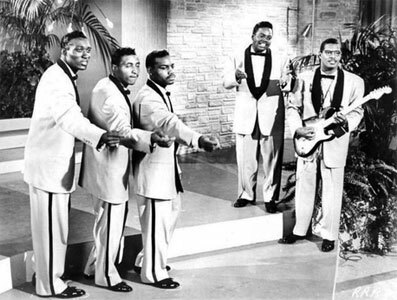 The group's status in the hierarchy of rock & roll -- or, at least, that corner of it under the control of Freed -- was confirmed when the Moonglows were included in the jukebox movie Rock, Rock, Rock, working alongside Chuck Berry, the Flamingos, LaVern Baker, the Johnny Burnette Trio, and Frankie Lymon & the Teenagers. 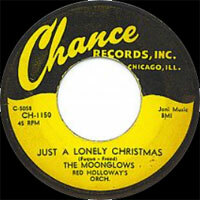 Later that same year, they also began work on what was to have been their debut LP, and early in 1957 they made another screen appearance, in Mr. Rock and Roll, a second jukebox feature, sandwiched in between many of the same acts as the prior movie -- this was to mark the last screen appearance of the original group, however. During 1957, in the wake of their unfinished debut album, Lester receded from the lead Vocals spot, yielding it to Fuqua, who already dominated the group as a producer, songwriter, and their de facto Vocals arranger. "Please Send Me Someone to Love," which got to number five R&B and number 73 on the pop charts, featured Fuqua on lead Vocalss and reduced Lester to back-up. The friction between Lester and Fuqua continued through most of the year, and the latter's increasing control of the group's direction also caused friction with Barnes, Graves, and Johnson, who were more or less caught in the middle between the two most identifiable voices in the group. Complicating their strained internal dynamics were the changes in public taste that had taken place since 1955 -- they not only couldn't decide who ought to be leading them, or agree on who should sing lead, but also on which direction their music should go in, toward the more pop-oriented sound of the Platters, who were selling large numbers of records to white audiences, or toward the harder sound that seemed to be coming out of some quarters of the black community, and seemed to be where black listeners were moving. Torn by these multiple schisms, the Moonglows' lineup collapsed under circumstances that are still a bit murky, in terms of who decided what and who exited. 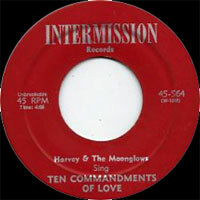 In late 1957, a pair of sides were recorded featuring Fuqua and possibly Johnson, and in early 1958, a new single appeared entitled "Ten Commandments of Love," featuring Fuqua as a speaker. 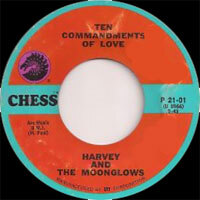 It reached number nine as an R&B hit and number 22 as a pop single, the group's best pop performance in two years and one of their biggest sellers, except that it wasn't credited to the Moonglows -- rather, it was also credited to Harvey & the Moonglows, and precisely who was singing on it behind Fuqua is still a matter of conjecture; some sources attribute the back-up to the original Moonglows, whereas others say with assurance that it was Fuqua's "new" Moonglows, actually formerly known as the Marquees, a Washington, D.C., outfit consisting of Marvin Gaye, Reese Palmer, James Knowland, and Chester Simmons. 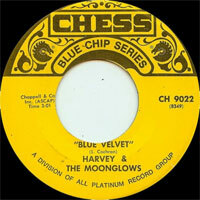 What is clear is that they accompanied Fuqua over the next year or so, credited as Harvey & the Moonglows. 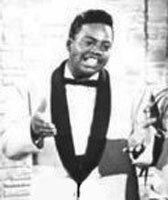 The group's ranks changed quickly -- though he kept Gaye, who had sung lead on the group's recording of "Mama Loocie," with him -- and eventually included a young Chuck Barksdale, from the Dells. In addition to his work with the new group, Fuqua was featured on solo singles throughout 1958, including "Don't Be Afraid of Love," which he co-authored with Berry Gordy, Jr. and Billy Davis, and also turned up miming in the last (and best) of the Freed showcase films, Go Johnny Go. Fuqua's professional association with Gordy had begun when they met, on the latter's visit to Chess to license the early sides of the Miracles; the two wrote songs together, and eventually Fuqua married Gordy's sister Gwen. He continued recording for several more years, including some legendary sides with Etta James, but increasingly concentrated on the purely creative rather than the performing side of music. 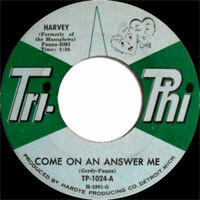 After operating such independent labels as Tri-Phi (where he recorded not only his own and the later Harvey & the Moonglows stuff, but also the early Spinners, whom he discovered as the Domingoes, and with whom he sang as well), he joined Motown as the executive in charge of developing new talent, and became not only successful in that department but also as a producer and songwriter, and was collaborating successfully with Smokey Robinson in the 1990s. 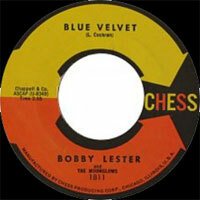 Having had the group and the group name pulled out from under him, Lester went solo on the Chess label for a short time, before giving up performing for a decade. 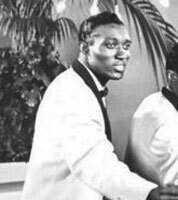 His name was well known enough and the recordings left behind with the group were good enough, however, so that as late as 1962 Chess saw the point in releasing a single credited to "Bobby Lester & the Moonglows," consisting of "Blue Velvet" and "Penny Arcade," the A-side culled from the group's abortive late 1956 album sessions -- this may have been simply Chess's way of trying to amortize everything but the kitchen sink in their operation, but it is difficult to imagine any other artist of the era, apart from Elvis Presley or Clyde McPhatter (or deceased figures such as Buddy Holly or Eddie Cochran), getting their six-year-old recordings pushed as new releases. Johnson passed through gigs backing Jackie Wilson and Brook Benton before joining Motown Records, and passed away in the late '80s. 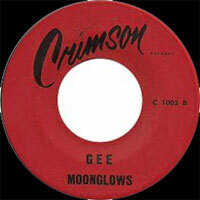 Walton put together a new Moonglows lineup in 1964 to cover some of the group's '50s sides, but this effort didn't last long, and Graves and Barnes left the music business, and the original Moonglows were consigned to history, apart from Chess' periodic attempts to continue selling sides left in the vaults. 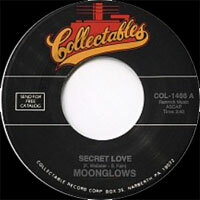 The label also released of a pair of LPs made up of the group's single sides, Look, It's the Moonglows (1959) and The Best of Bobby Lester & the Moonglows (1962). 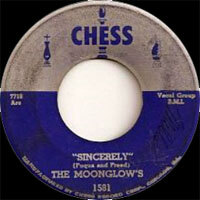 Chess kept several vestiges of the Moonglows sound alive more profitably when they signed the Dells, and the group's sound could also be heard in the early work of the Four Tops (who had also spent time on Chess) and the Temptations at Motown. Lester tried reviving the group name twice, at the beginning and end of the '70s, and even recut "Sincerely" the first time around. That composition remained the jewel in Fuqua's songbag -- in 1990, 36 years after the Moonglows cut their version and 35 years after the McGuire Sisters' pop hit, the Forester Sisters' country rendition of "Sincerely" earned a Grammy nomination; that same year, filmmaker Martin Scorsese (who is known to take a very deep interest in the music used in his movies) used the Moonglows' version of the song in the film Goodfellas. 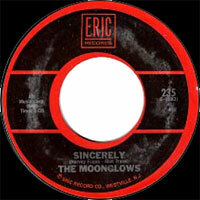 Between the original and the successful covers, "Sincerely" bids fair to remain a popular song well into the 21st century. 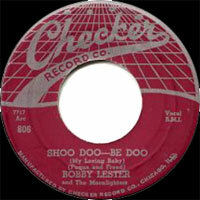 11/1954 78 t. & SP CHECKER 806 (US) . 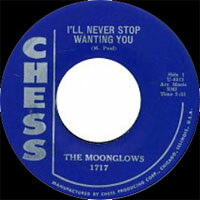 04/1958 78 t. & SP CHESS 1689 (US) .